The HART® Multiplexer Modem 5700 interfaces up to 256 smart devices (transmitters, I/P, proportional valves, etc…) in a HART® Network. Each device can be fully identified, configured and monitored by a remote PC running an FDT-based software package through a dedicated Device Type Manager (DTM). The module is intended to be mounted on Termination Board TB-D5001-HRT-003 (to be used with G.M. International AI/AO Termination Boards) or TB-D5001-HRT-004 (to be used with DIN-Rail mounted barriers/isolators or direct field connections). The HART® Multiplexer Modem 5700 is certified SIL 3 as non-interfering with the signal loops. The module guarantees three-port (supply/interface/channels) isolation. • installation in Zone 2 / Division 2. • High Density, 256 Input channels. • HART® field device input, revision 5 to 7. • Three port isolation, Supply/Interface/Channels. • Simplified installation using standard customised Termination Boards. The HART® Termination Board model TB-D5001-HRT-004 allows the remote monitoring of any HART®-compatible 4/40 mA field loop. This is obtained by one locally mounted HART® Mux Modem 5700 and by terminal block interface connectors to access the relevant loops. The board is installed in series to the loops and is totally transparent to both transmitter and receiver. 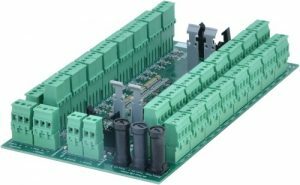 The single TB-D5001-HRT-004 Termination Board supports 32 channels. Yet, it can be extended with additional TB-D5001-HRT-004 units (up to 8) to manage all 256 channels available on the HART® Mux Modem 5700. The Mux unit connects, via the RS-485 interface, to an external PC running an FDT based software package (PACTware™, etc…) through a dedicated Device Type Manager (DTM). The PC can communicate with multiple Mux units, located on different boards, in a multi-drop RS-485 mode.